PORT CHARLOTTE, Fla. (April 12, 2019) - Jack Labosky went 2.2 scoreless innings and Jim Haley picked up two more hits Friday, but the Charlotte Stone Crabs lost the series opener with the Palm Beach Cardinals 6-2 at Charlotte Sports Park. After Palm Beach (7-2) took a 1-0 lead on a passed ball in the first, the Stone Crabs (3-6) quickly erased the deficit in the second. Moises Gomez singled to center before advancing to third on a Russ Olive single. With one out and runners at the corners, Garrett Whitley drove a fly ball to right to score Gomez and level the game at one. With the game still tied in the bottom of the fifth, Whitley smacked a triple to the wall in center with nobody out. Haley followed by banking a single off the glove of first baseman Zach Kirtley, scoring Whitley to give the Stone Crabs a 2-1 lead. However, the Cardinals rallied for multiple runs in the sixth and seventh. With two men on in the top of the sixth, Yariel Gonzalez dropped a double down the right field line to score Nick Dunn and tie the game at two. After Nick Plummer made it 3-2 with a sacrifice fly to right, Julio Rodriguez singled to right to cap the rally and give Palm Beach a 4-2 lead. The Cardinals added two runs in the seventh on a Kirtley double and a Dunn single. 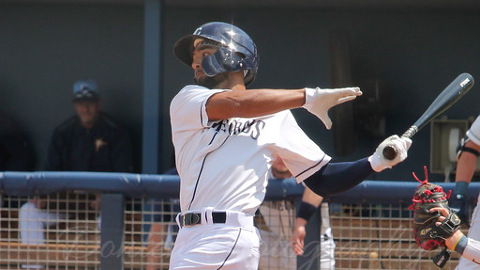 Friday marked the second time the Stone Crabs used an opener. Tanner Dodson allowed one unearned run over three innings before handing the ball to scheduled pitcher Tobias Myers (0-1). The Stone Crabs will look to even the series at 6 p.m. Saturday night. Paul Campbell (0-1, 13.50) makes the start for Charlotte, against Angel Rondon (1-0, 0.00) of Palm Beach. Coverage begins at 5:45 p.m. on the Stone Crabs Baseball Network.